A Christian Spanish summer camp for girls – run by nuns – is the setting for a divinely irreverent coming-of-age musical that is like nothing you’ve ever seen before, set to the music of Whitney Houston. Just go with it. 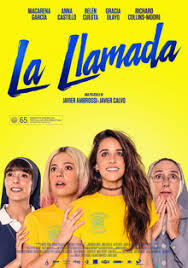 Based on their hit play “La Llamada” (The Call), Spain’s emerging dynamic duo, Javier Calvo and Javier Ambrossi have done it again with Holy Camp!, a gloriously camp musical comedy about two mischievous girls whose summer of adventure turns into something neither of them could predict. Spanish actor and singer, Macarena García (real-life sister of Javier Ambrossi) plays María, a rebellious teen whose BFF is the incorrigible Susana, in a rapid-fire, feisty performance by Anna Castillo. Their shared passion is the electro-Latin dance music of the club scene, and with a dream of making it big as a singing act (they call themselves SuMa Latina) there’s nothing these two won’t do to escape the confines of the campgrounds and sneak off into town. Their confidante is a sensitive young nun named Sister Milagros (played by Belén Cuesta) who clearly feels an acute conflict in her own religious calling. The new director of the camp, Sister Bernarda (played by Gracia Olayo) is a force to be reckoned with, and has two devotions in her life: the Lord and the music of Whitney Houston. The two collide when young María lets it be known that God himself – in the form of a middle-aged white guy in bedazzled lounge-singer costumes – has been appearing to her and crooning the love songs of none other than the pop diva herself, Whitney Houston. What’s going on? Hallucination or Visitation? Does Maria need an exorcism or a benediction? Shouldn’t someone call the Vatican? Hilarity ensues, the music is great, and something else entirely unexpected sneaks in: Grace. Comparisons may be made to other well-known movies in which we have singing and dancing nuns, such as Sister Act and even The Sound of Music, but that’s where the split screens end. This is no Sister Act, and the Maria in The Sound of Music would be turning in her grave to see the wildly sexual excesses set to a campy musical groove in Holy Camp! If anything, perhaps the 60s’ Hayley Mills classic, The Trouble with Angels comes to mind as the prototype for the juxtaposition of rebellious youth with ecclesiastic obedience. Holy Camp! takes a while to adjust to. But – like faith itself – once you settle in and get on the ride, any tonal incongruity or breathless, over the top chattering (by the characters) is forgiven for the sheer joy in the making of this (certainly) eccentric but heartwarming little picture. Because at its heart, Holy Camp! is nothing if not an ode and a musical prayer to Love in all its forms: Divine, Romantic & Sensual. A wonderfully Divine Comedy. Holy Camp! is presently streaming on Netflix.